Is Visibility an Uphill Battle for Your Products? Dumped in a bin or shoved on a shelf, sometimes visibility is an uphill battle for small or unusually shaped products. When your product is unpackaged, it could roll or fall behind other products, obscuring details and becoming frustrating to stock or display in retail settings. 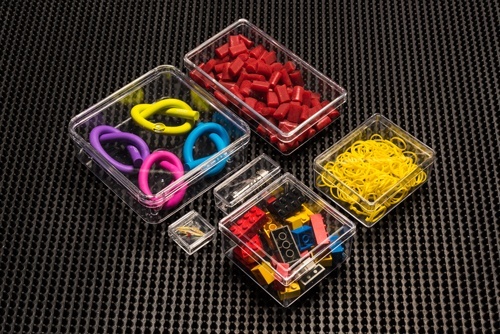 Clear plastic packaging levels the playing field, allowing your products to be shipped, sorted and stacked in an orderly way that minimizes damage and loss. In addition, opting for a clear box material–such as Alpha Rho's clear rigid plastic packaging–ensures that there's nothing between your customer's eyes and your product but an attractive, branded packaging solution. While packaging is often considered a necessity rather than a feature, the benefits it offers can easily be presented as a value-added leg up when negotiating new sales accounts. With well-lit, in-box photography of your product in hand, your product will gain more attention and have a better chance of beating out competitors using blister cards or going "naked" for their product displays. While paper packaging can fade and even lose integrity if moisture is present, general-purpose polystyrene packaging will hold up well–even in sunlight. Dust wipes clean, and your packaging won't tear or rip the way cardboard often does when being frequently handled. If you want your products to look as appealing a year later as they do the day they're stocked, clear plastic boxes are definitely the way to go. Not sure which clear rigid plastic product packaging is right for your brand? Contact Us at Alpha Rho for recommendations, orders, and assistance finding the perfect “look” for your products.